Sometimes ingredients are so fresh and delicious that very little needs doing with them in order to make a memorable dish that you will cook time and time again- this is one of those dishes! if you regularly read my recipes you will have worked out that I love seafood in its many guises and scallops are no exception. Sweet, tender and succulent scallops need to be paired with simple, clean flavours so you can appreciate their beauty. I have paired a classic base of garlic, a little chilli and sweet tomatoes to allow each flavour to sing. To make this even more accessible, I have used bay scallops which tend to be easy to find and a little cheaper than their larger sea scallop counterparts. If, however, you do want to use the larger ones then go ahead. This is also quick to do so there is no excuse to pick up the takeaway menu after a day at work so read on and get cooking! 1. Kick off by getting your pans at the ready- you will need a pan for the pasta so boil a kettle and bring the water to the boil. You will also need a pan that the sauce can simmer away in and one for pan frying the scallops. To make the sauce, simply heat a glug of oil over a medium heat and cook the garlic and chilli until softening, but make sure the garlic does not catch colour. 2. Throw in the halved cherry tomatoes and the white wine; simmer until the wine is reduced by half. Keep the tomatoes cooking away until the they reduce and the juice starts to make a sauce. Keep this on low. Meanwhile cook the pasta according to the packet instructions; drain well and set aside. 3. As the pasta cooks, take the remaining pan and heat the butter and a splash of oil over a medium to high heat. Pan fry the scallops until they are golden on the outside which usually takes a couple of minutes on each side but do keep an eye on them so they don’t overcook. As the sauce is finishing, add in the torn basil before tossing the pan fried scallops through so they are lightly coated in the sauce. Add in the drained pasta and serve! It’s that time of year again when minds turn to lighter meals but without compromising on flavour. This tagliatelle recipe is super speedy and delicious so get reading and rustle this up in under half an hour. I lightened this up by using a low fat creme fraiche but you can substitute this with cream if you prefer. It is also delicious without the ham for a vegetarian version. 1. Start off by bringing a large pan of water up to the boil and cooking the pasta according to the pack instructions. 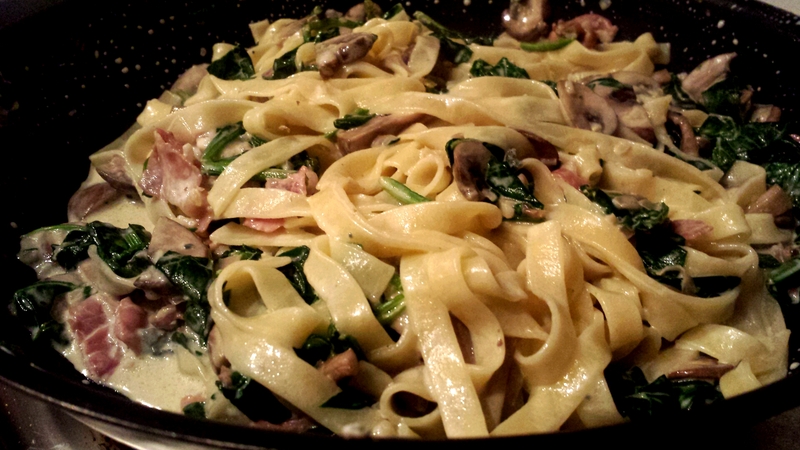 Try and aim for al dente tagliatelle so it won’t go limp and soggy. 2. Take a large frying pan and heat a small amount of oil. Cook the shallot and garlic for a minute before adding in the sliced mushroom for an additional couple of minutes until beginning to turn golden. Add the ham ribbons and cook for another minute. 3. Pop in the spinach and allow to wilt before taking the pan off the heat and stirring through the creme fraiche and blue cheese. You must take it off the heat so the creme fraiche doesn’t split. Season to taste. 4. When the pasta is ready, drain well and add to the frying pan and combine with the sauce. I sometimes finish it off with a small amount of freshly grated parmesan cheese before serving. A light yet creamy spinach perfect for Spring!